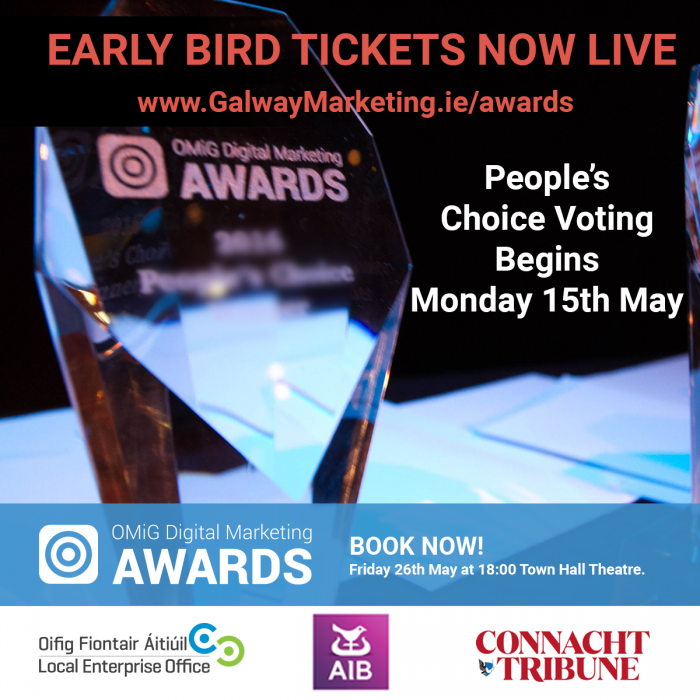 Awards finalists to be announced and People's Choice Voting begins Monday 15th May - Who will you choose as your 2017 Galway Digital Marketing Hero? Finalists for all categories of the OMiG digital marketing awards will be announced on Monday 15th May, 2017. On this date the People’s Choice Voting will also go live, so get ready to choose your favourite. Doug Leddin of An Pucán and previous winner of the People’s Choice Award and the Social Media Award in 2016 stated, “It was just fantastic the whole OMiG experience in 2015. It really helped us to engage more with our customers and learn how each one could help us spread awareness and how we could help them enjoy their night life better”. Please remember that the nominations for the awards are open until Wednesday, 24th May at 17:00 via the OMiG website at www.galwaymarketing.ie/awards/. “The central location, the team and the stakeholders behind the PorterShed, including Mary Rogers, Community Manager and all the partners and sponsors have been a superb support to OMiG to date. The organic business community that has been created within the PorterShed has led to OMiG using the facilities as a base more for their meet ups and events. With AIB’s involvement with the Portershed as a main sponsor, the partnership for the OMiG Awards and future events this year made perfect sense”. Evin Cusack, Head of AIB Galway, welcomed OMiG to its commitment to ‘backing brave’. “AIB is delighted to sponsor the Online Marketing in Galway awards for 2017. OMIG is a great organisation that creates awareness and understanding of how digital marketing strategies can have a positive lasting impact on business growth and brand reputation. These awards recognise those businesses that have embraced this innovation and are striving for growth. This sponsorship is another illustration of AIB’s commitment to backing brave”. The OMiG digital marketing awards will take place on Friday 26th April at the Town Hall Theatre, Galway. The awards ceremony is a must attend event for those involved in digital marketing. Along with the celebration of the winners and finalists, we will once again be hosting a panel discussion by some of Ireland’s Top Digital Marketing Executives. Full details will be announced in two weeks. Early bird tickets are priced at €10 and are now available at www.galwaymarketing.ie/awards. The awards are held in partnership with Galway’s Local Enterprise Office, the Connacht Tribune Group, Bentley Productions, Cantec, and this year we are proud to have AIB as our main events sponsors. …. and we are back!! OMiG Christmas Meet Up & Party, BOOK NOW! Orla on How to turn an unprofitable website into a profitable one in seven easy steps.